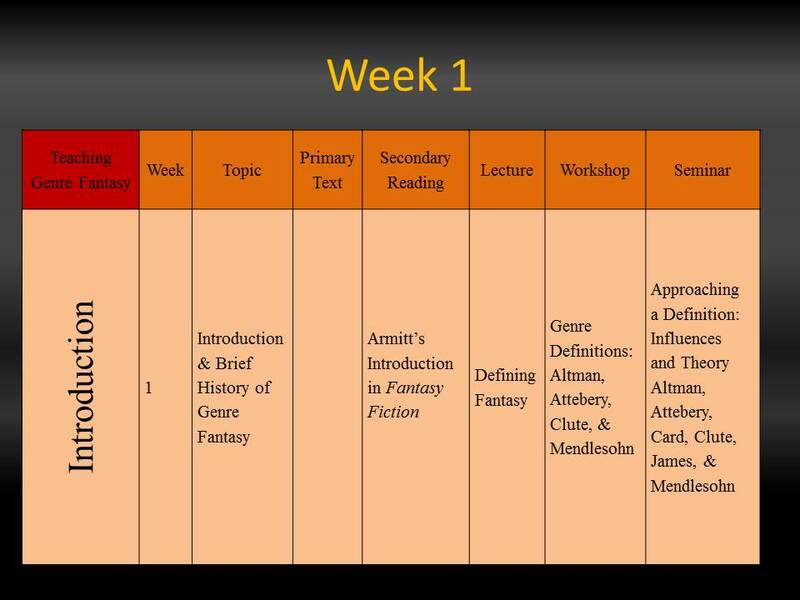 The first week of classes is given over to the endless discussion of defining fantasy. 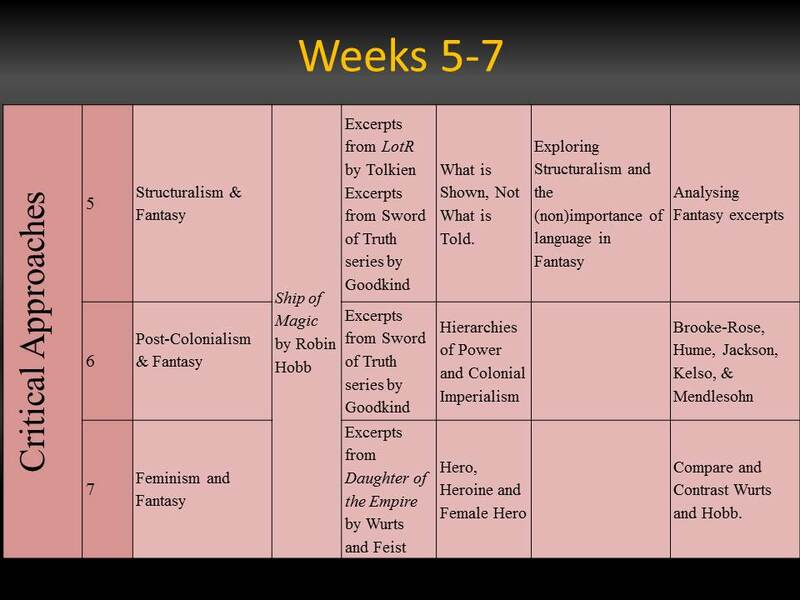 While there are no definitive definitions that conclusively encapsulate fantasy, by taking a chronological survey of the early fantasy texts and then workshopping some of the critical definitions the students should have a general appreciation of the tradition of fantasy narrative. In particular, Armitt’s introduction, Clute’s definition in the Encyclopedia of Fantasy, and James & Mendlesohn’s definitions in A Short History of Fantasy give a broad appreciation of the various approaches to what Fantasy is. However, by including Altman’s genre theory we can broaden the definition beyond fantasy specifically and take account of methodological bias that may be part of the fantasy definitions. This first week then serves as a primer for the basic information necessary to challenge some basic assumptions students may have about the course, about fantasy and to set the tone for a critical awareness rather than a popular reading course. The next section is a three week block focusing on tropes, structures, clichés and potential narratological aspects that can help define the genre. The key text running through this section is Magician by Raymond E. Feist. As a D&D influenced text, Magician not only provides an example of the RPG style of fantasy text, but it also contains three key fantasy storylines, the mage, the warrior king and the politician. 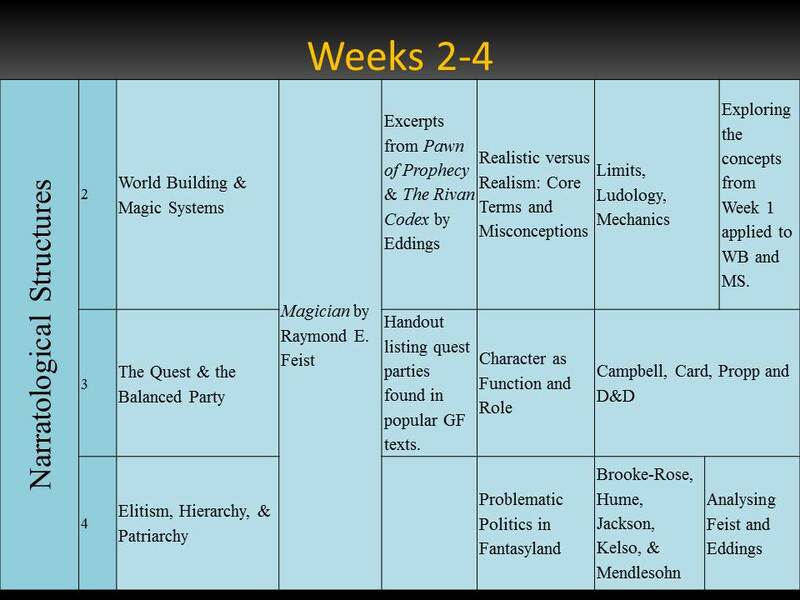 The three weeks are then divided into World building and Magic Systems, which deals with diegetic formations and the importance of believable, limited settings. The Quest and the Balanced Party, which takes into account function, role and character as well as exploring the setting in terms of discontiguous narrative ludic spaces. Lastly, the section deals with politics and social constructs in fantasy and the problematic nature of pseudo-medieval settings with modern socio-cultural power dynamics. The second core section is the practical application of literary theory to an example fantasy text. This is intended to hone students’ critical and analytical skills, reinforce their awareness of critical theory, and to bring that focus to bear on a fantasy text to demonstrate the usefulness of non-mimetic literature in providing fertile discussion of complex and often heated issues. I chose Robin Hobb’s Ship of Magic, book one of the Liveship trilogy, to be the key primary text for this section for a number of reasons. The first being that I wanted to dispel the myth that fantasy is male only. The second is that the novel again contains three interweaving story threads allowing for interesting and dynamic interpretations. I have paired Hobb with excerpts from several other key fantasy texts. The Battle of the Hornberg from Tolkien’s LotR. Some small excerpts from Goodkind’s Sword of Truth. And some sections from Janny Wurts and Raymond E. Feist’s Daughter of the Empire. Beginning with structuralism allows the students to examine what is happening, not necessarily what they are being told, and is a valuable exercise for undergraduates. 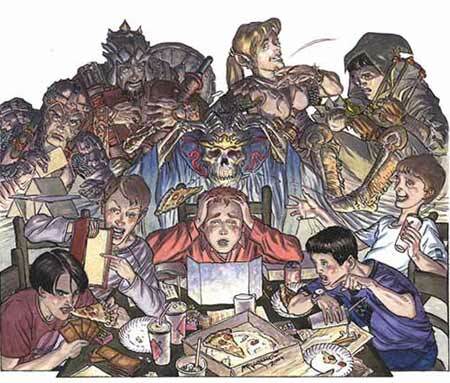 Fantasy texts are often narrated from a subjective limited focalisation and present a simplistic moral polarity/binary. By taking the texts apart with a structural analysis they can re-examine what they are being told in a new light. Hopefully this will encourage critical analysis and greater free thinking. Moving then to colonialism and post-colonialism brings in otherness, and entrenched cultural biases and solid examples of power hierarchies on a grand scale. This then becomes refined to the personal political in the last section by investigating feminism and fantasy. Week 8 is traditionally when a ‘reading week’ happens. This gives the students a chance to consolidate notes, work on their paper, and have time to meet with lecturers to address any issues or problems they are having with the work. Thus far the sections have focused on basic foundational work and then the application of general literary theory. 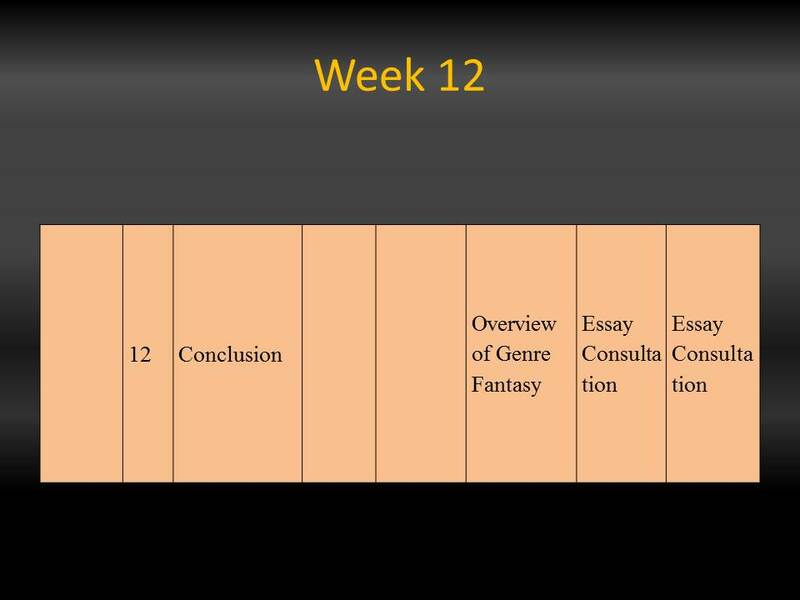 The last section moves on to discuss fantasy specific analysis, and an understanding of the nuances within the genre, as well as some broader concepts. The key text here is Erikson’s Gardens of the Moon which manages to be a subversive, post-structural and post-modern fantasy narrative, while at the same time remaining firmly in the the centre of the genre. 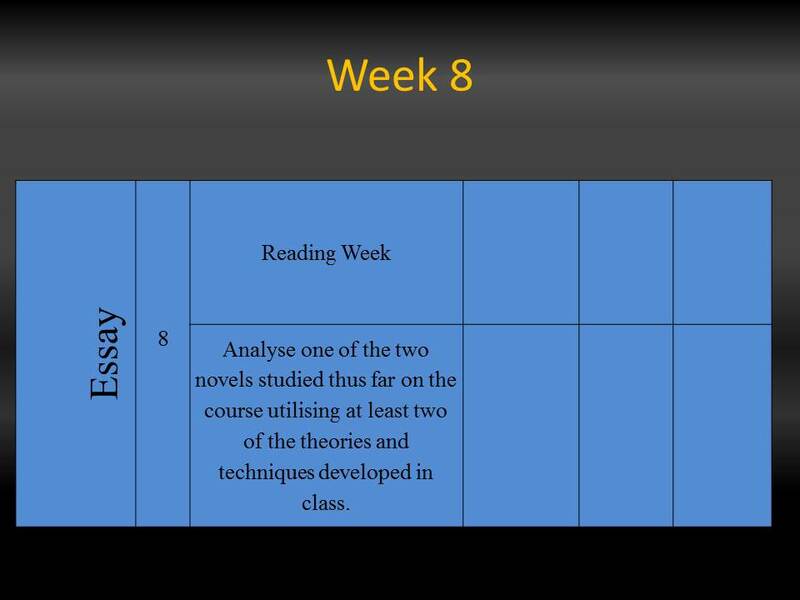 The first week of this section focuses on finding formulas, and understanding the differences between formula, patterns, structures, tropes and clichés in relation to defining the genre specifically. 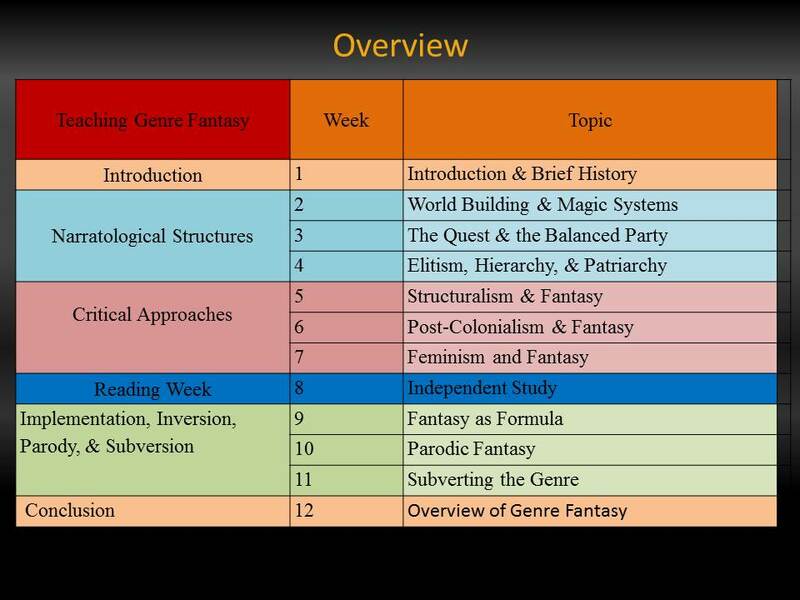 So it is a return to the earlier part of the module, but the students should be much more prepared to enter into discussion and to deconstruct assumptions about ‘generic’ fantasy. The next week shifts the focus from formula to parody. Thereby highlighting different aspects of subversion, and inversion and bringing in concepts of meta-narrative and meta-text. The last teaching week brings together the concepts of subversion in relation to Erikson’s Gardens of the Moon and basically is a primer for the set extended essay coursework. Clute, John, ‘Grail, Groundhog, and Godgame’, JFA, 10:4 (2000), pp.330-337. ________, ‘Conjunctions 39 and Liminal Fantasy’, JFA,15:3 (2005), pp.228-39. This entry was posted in Paper and tagged Article, Fantasy, Gardens of the Moon, Genre, Paper, Steven Erikson, Teaching. Bookmark the permalink. It was an experiment to do something that wasn’t chronologically organised and would be easy to swap in and out various texts to make the course easily update-able, renewable, and would still be useful to students. Glad it was of help. 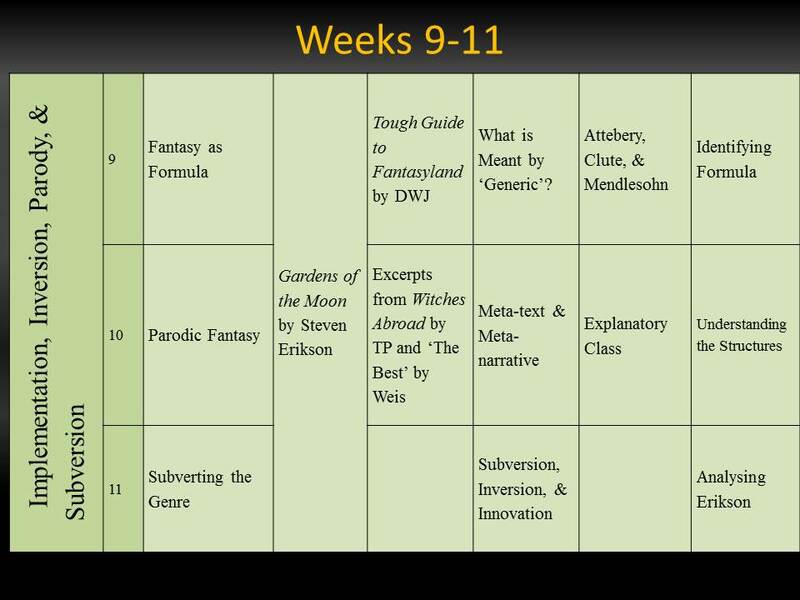 Let me know how your course goes (and if possible send me a copy of the syllabus) because I am always interested in seeing how other people construct and teach the genre. ReadWriteThink couldn’t publish all of this great content without literacy experts to write and review for us. If you’ve got lessons plans, videos, activities, or other ideas you’d like to contribute, we’d love to hear from you. I very much appreciate the critical materials, especially the articles. I have a good sense of what primary lit I want to do, but I’ve been struggling to find the right voice for criticism that won’t overwhelm students’ own questions. Thanks!